brownie double tap | eating with S.O.L.E. I think we can mostly all agree that everyone loves brownies; fudgey dense chocolately squares, rich and dark… not to cakey, certainly not under-baked and gooey. Now when your imagining the perfect brownie what could make it even more perfect, aside from a fudgey frosting? What about a second layer of brownie, and yet another slap of frosting. 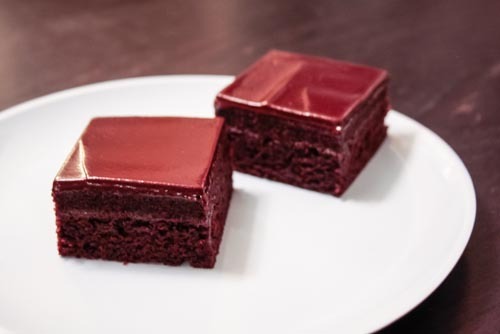 Let me attest that a brownie double tap does indeed make for an even more perfect brownie, especially when your recipe (like this one) makes the quintessential brownie. I didn’t actually set out to make a two layer brownie, but sometimes in the kitchen you just go with the flow and remarkable things happen. I knew this recipe would fill a 9×13 pan… but frankly I really dislike the rounded corners of pyrex bakeware and I opted to use my smaller rectangle tart pan with a scalloped edge and a push through bottom (which makes for dreamy presentation). Because of this I had about 1/4 of the batter left over and decided to add to it 1/3 cup of strong cold coffee, whisk well and bake off in a smaller rectangle tart pan. Ta-Da brownie slab was born. This frosting is a chocolate gnache (vegan style) with the thick cream from a can of coconut milk and divine callebaut chocolate. If I had time or foresight (which you may well have now) I would make the middle layer of gnache with white chocolate or milk chocolate to make the stunning layer lines even more enticing. mix until combined, your batter will be slightly thick and very dense. The thin brownie should be cooked through in about 16 minutes, the larger brownie should take 35 minutes. Check for doneness of brownies by tapping the top with your finger tips, it should feel set and pretty firm. * half this recipe and use two difference types of chocolate if you want to have the middle layer pop. then add your final slather of gnache goodness and allow to set fully before cutting. * and if you want perfect slices use a long knife and run it through hot water and wipe clean between each and every cut, to achieve perfectly neat professional squares.